My grandson's graduating from High School. Third grandchild and second grandson to graduate high school. This is the 3rd throw that I have ordered from Miles Kimball. The kids have absolutely loved them. They are of good quality. Purchased my first granddaughter one several years ago and she still has it today. She loves it. My last child is graduating from high school in May of 2018 and I want him to have a "memento" of this occasion to keep always. I have 3 granddaughters, one an adopted one. Two graduated in '17 and this was one of the gifts I gave them. They were thrilled. In May '18 my last granddaughter graduates, I wanted to be sure she has one to cherish of her school years, and remind her of her grandma once-in-awhile. Ordered one a month or so ago and it arrived quick and STUNNING!!! Gave it to my niece this past weekend and she JUST LOVES IT!! She hung it up as part of her DECORATIONS at her graduation party!!! She got soooo many compliments!!! She kept thanking us over and over. Have ordered another one for a cousin who is having a graduation dinner in a few weeks. CAN"T WAIT TO SEE THEIR REACTION!!! It has become a family tradition since I found it about 10 years ago. The quality is excellent and I had purchased one for her high school graduation. Wanted one for her college graduation. Because I have 11 grandchildren and this makes the 10th one to graduate and they have all received this afghan from you and I have one left who will graduate in 2021 and I hope to be able to get her one also. This something that will last my niece a lifetime and she will always remember she accomplish her dreams receiving her Masters.I thank your company for having this available and at a reasonable price.I LOVE THIS COMPANY!!!!!!! 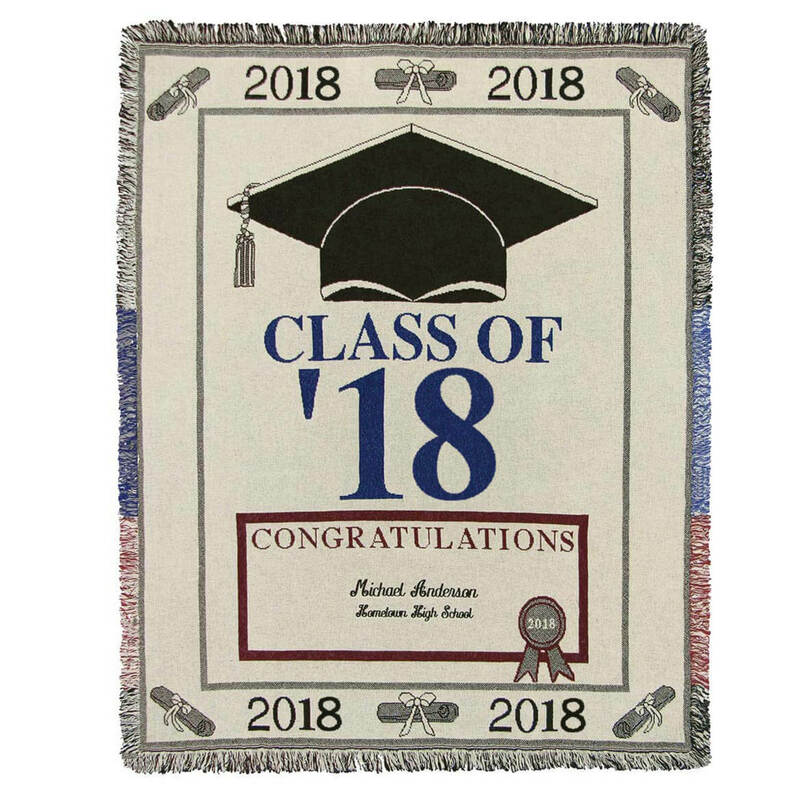 our granddaughters will graduate in June it looks like a very nice throw and it should be nice for them to have as a reminder of their time in high school. children of friends graduating from High School this year and I give them as gifts. please provide size of Afhgan? BEST ANSWER: Thank you for your question. The afghan measures 60" long x 50" wide. We hope this information will be of help to you.